Maytag dishwasher displaying an error code? Flashing lights or blinking lights? Maytag dishwashers have built in diagnostic systems. If your dishwasher detects a fault or error in the system, it will show an error, the lights will flash, blink, or a fault code will be displayed. The error code will display or the lights will blink on the panel. When an error code or light is blinking, your dishwasher is identifying a specific fault has occurred. The error code or the light blinking sequence will indicate which part or parts on your Maytag dishwasher need to be replaced or checked. You can also Search YouTube for Maytag Dishwasher Flashing Blinking Lights or get advice from your Maytag dishwasher owners manual when your Dishwasher Is Displaying An Error Code or flashing the lights. If your Maytag dishwasher does NOT have a digital display, the Clean Light will first flash the Function Code. Then the Clean Light will pause for 2 seconds and then flash the Problem Code. You need to count the flashes the Clean Light displays to understand the error code on your Maytag dishwasher. As an example: If the Clean Light flashes 8 times followed by 3 flashes (8-3), this error is telling you the Function Code = “Drain Pump” and the Problem Code is “The drain pump is stuck in the on position”. The error code will repeat by flashing the light patterns again after a 5 second pause. NOTE: The control panel console will be fully disabled when an error code is flashing. Meaning you cannot use the buttons and they will be unresponsive until the error is cleared. 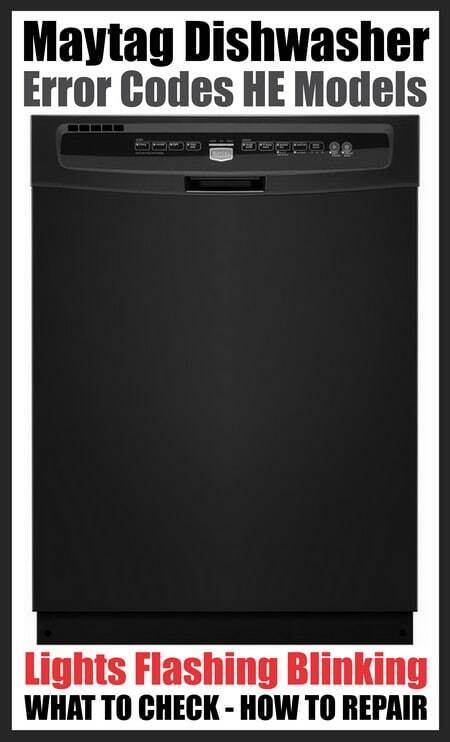 Maytag Dishwasher Front Panel Blinking – How To Clear/Reset? Repair or Check | Remove power to the dishwasher for 5 minutes to try and reset. If the error code comes back when power is applied then check the wiring and the components. If the wiring and components check out then replace the electronic control board. Repair or Check | This error code will show when the wrong user interface control is installed. Repair or Check | If no keys work replace the electronic control panel. If the control panel is damaged then replace the electronic control panel. If the control panel is in working order then the problem may be within the electronic control board. Repair or Check | Remove power to the dishwasher. Check the wiring between the user interface control and the electronic control board. If the wires and connections check out then replace the user interface control board. If the problem comes back then replace the electronic control board. Error Condition | There may be a break in the electrical wiring OR the thermistor (water temp sensor) component failed. The optical water indicator that detects the amount of debris in the water may have also failed. Repair or Check | Remove power to the dishwasher and check the wiring for the thermistor and optical water indicator circuit. If the circuit wiring checks okay then replace the thermistor and optical water indicator component. Repair or Check | Remove power to the dishwasher and check the wiring for the thermistor / optical water indicator circuit. If the circuit wiring checks okay then replace the thermistor / optical water indicator component. Repair or Check | Remove power to the dishwasher and clean the optical water indicator. If the error code comes back once you apply power then replace the optical water indicator (OWI). Repair or Check | Remove power to the dishwasher and check the wiring from the wash pump motor to the electronic control board. If the wiring checks to be okay then replace the wash pump. If the problem comes back then replace the electronic control board. Repair or Check | Press start button and close the dishwasher door. If the code shows then remove power to the dishwasher. Check the door latch assembly and the wiring for the door switch. If the latch assembly and the wiring are in place and check good then replace the door switch. Repair or Check | Check to be sure the wiring in the door switch checks good. If the door switch wiring checks good then replace the door switch. Repair or Check | Remove power and turn off the water supply to the dishwasher. Be sure the water supplying the dishwasher has proper flow and good pressure. Check wiring to the water inlet valve. If the wiring checks good and the water supply checks out then replace the water inlet valve. Repair or Check | Remove power and turn off the water supply to the dishwasher. Be sure the water supplying the dishwasher has proper flow and good pressure. Check wiring to the water inlet valve. If the wiring checks good and the water supply checks out then replace the water inlet valve. If the problem persists then replace the electronic control board. Repair or Check | Check the water fill level. Check for suds in the fill water at the bottom of the dishwasher tub. If the water fill level is low then replace the water inlet valve. If you find excess suds then check the detergent dispenser and replace it if damaged. Repair or Check | Check the overfill float switch and make sure it is not stuck under there is something under it holding it up. Be sure the water inlet fill valve is shutting off the water when the dishwasher is turned off. Repair or Check | Use thermometer to check the water temperature coming into the dishwasher. If the water is lower than 110F degrees then check your water heater. Adjust water heater if needed. If the water temperature coming into the dishwasher is between 110F to 120F degrees then replace the thermistor / optical water indicator or as last resort the electronic control board. Repair or Check | Remove power to the dishwasher. Check the wires to the flow meter. If the wiring checks good then replace the flow meter. Repair or Check | Remove power to the dishwasher. Check the heating element and replace it if you find it to be burned or faulty. If the heating element checks good then check the wires to the heating element. If the wiring checks out then replace the heating element. Repair or Check | Remove power to the dishwasher for 10 minutes. If the error code comes back when you turn power back on then replace the electronic control board. Repair or Check | Remove power to the dishwasher and turn off the water supply to the dishwasher. Check the drain path to see if something is blocking it. 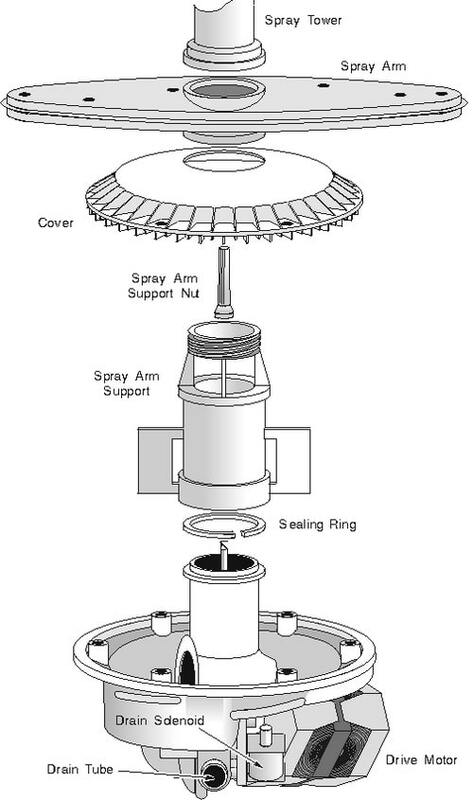 If the drain path is clean and completely clear then check the wires on the drain pump. If the wiring check out then replace the drain pump. Repair or Check | Remove power to the dishwasher and turn off the water supply to the dishwasher. 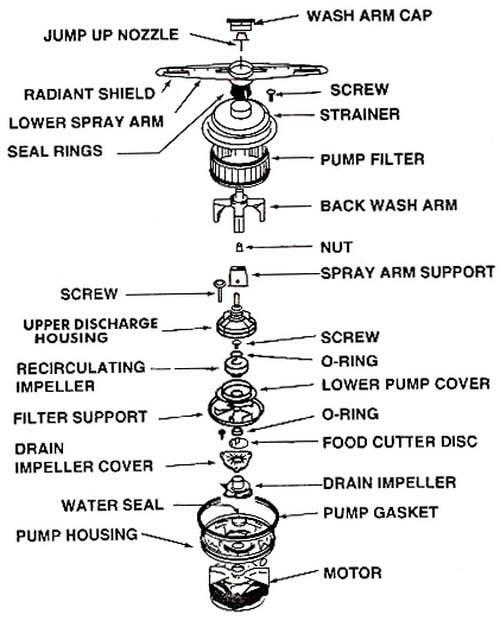 Check the wires on the drain pump. If the wiring checks out then replace the drain pump. Repair or Check | Remove power to the dishwasher and check the drain pump wires. If there is damage to the the wire harness replace it. If the wiring harness checks out then replace the electronic control board. Repair or Check | Remove power to the dishwasher. Remove the outer door panel. Check the wires in the detergent dispenser. If the wiring check out then replace the detergent dispenser. Repair or Check | Remove power to the dishwasher. Check the wires for the the drying fan. If the wiring checks out then replace the drying fan. These other Maytag dishwasher resource pages will help you with additional information with fixing or identifying a problem with your Maytag dishwasher: DIY fix your Maytag dishwasher on the cheap and Maytag Dishwasher Repair Manual and Repair. These resources will help you with fixing your Maytag dishwasher. 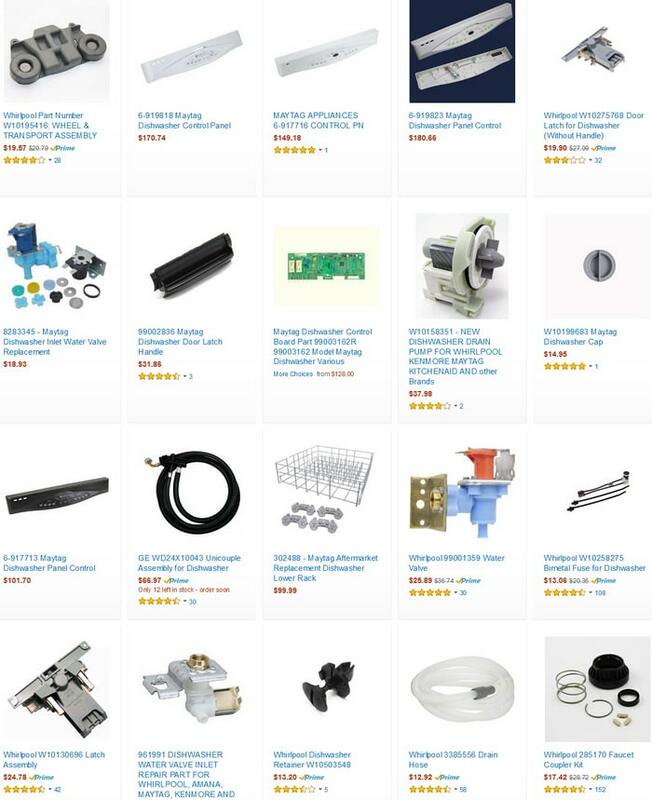 If you need replacement parts for your Maytag dishwasher, see below for all the parts we have listed above that may be causing your Maytag dishwasher to have flashing or blinking lights. Do you have an error code or the clean light is flashing or blinking in sequence indicating a problem with your Maytag dishwasher? Please leave your question below and we can help assist to troubleshoot your Maytag dishwasher issue. Quick Wash light blinking ten stopped then blinked again. Didn’t know I needed to count. All while system in normal cycle. Also the Control lock keeps going on when not in use and blinks. When I hold down it goes off and I can run the unit. Maytag dishwasher MDB4949SDM1 displays Error codes E2 and F2.